The success of adding pet food to the menu of Bifrost Farms services has us really excited! Rural residents of central western Wisconsin no longer have to drive to Eau Claire or Hudson for premium dog food. Please help spread the word to check with us first for quality dog and cat food. If I can get it, I guarantee is will be cheaper than any other local outlet. We introduced a new brand to our lineup called Dave’s Pet Food which has become very popular. We like Dave’s because it’s a small label with a formula created by the owner of an independent pet store in the Northeast who wanted to be able to offer a high quality food at an affordable price. By eliminating the middleman, Dave’s prices are comparable to larger name brands such as Purina and Science Diet, but with much healthier ingredients. Although we do not maintain a huge inventory like large box stores because we always want the food we sell to be freshest it can be, Bifrost Farms has started keeping small bags of Taste of the Wild, Premium Edge and Dave’s in stock for up to two months. If these inventory bags are not sold by then, we feed them to our own dogs and restock to keep everything fresh. They say that referrals are the best way to grow a business and Bifrost Farms is ready to GROW!! From now until 12/31/12, if you refer a new client to us who reserves at least three nights before the end of 2012, you will receive three nights complimentary boarding for your own dog. How’s that for appreciation? I’ve always thought our clients are the best. It’s clear they care about their dog’s well being and want what’s best for them, and we realize the great degree of trust it takes to leave your well-loved dog companion with us when they can’t travel along. EOs often get lumped in with many woo-woo and new age remedies, but the fact remains I have witnessed some pretty amazing results using high grade therapeutic essential oils. Everything from arthritis pain disappearing in minutes to open wounds closing and knitting together faster than expected. Every month we’ll look at a different oil and what it is most commonly used for. Julie Schuler, formerly of Julie’s Fauna in Menomonie, is available by appointment for anything from a simple nail clip to a full blown fancy cut. Give us a call ahead of time if you’d like your dog groomed while boarding at Bifrost Farms. Monthly clinics are held at Embark Doggie Daycare in Eau Claire, with auxiliary clinics in Boyceville here at Bifrost Farms every three months. If you’d like more information or have questions, please always feel free to call. In the meantime, this post I wrote last year is a good place to start. What’s this anesthesia-free pet dental thing all about? 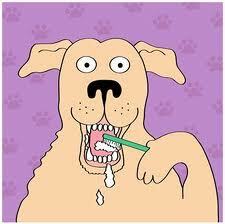 Anesthesia-Free teeth cleaning for your pet comes to Boyceville! After several successful clinics in Eau Claire at Embark Doggy Daycare, we’re bringing one home. Tuesday, October 4th, 2011, Meg and Dr. Linda Vognar will be at Bifrost Farms for a No-Anesthesia Teeth Cleaning clinic for your dogs and cats. The cost will be $110/per pet. Call the Farm at 715-643-2208 to reserve your pet’s spot. There are only four left. And if you’d like to see an example of what we do, check out our previous post on anesthesia-free teeth cleaning, complete with video.